Judge and finalist at the 2012 MIASMA Halloween party. 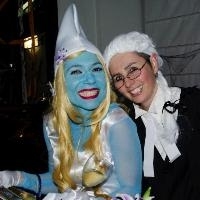 L-R: The winner, PhD student Indzi Katik (Immunology), as a Smurfette, awarded first prize by Judge Dr Jane Arthur (ACBD). Established in 2010, MIASMA (Monash; Immunology, ACBD, Surgery and Medicine at the Alfred) is the social committee serving all staff and students from Monash’s Central Clinical School (CCS) and School of Public Health and Preventive Medicine (SPHPM). The contact email for MIASMA is miasma.amrep@monash.edu. Committee elections take place on an annual basis and are open to all staff and students of CCS and SPHPM, including those with joint appointment through the Baker IDI or Burnet Institute. The committee meets once a month and is responsible for organising a number of major social events throughout the year. MIASMA welcomes enthusiastic and social staff and students to join the committee and become involved. More information on upcoming MIASMA events can be found on the Calendar below. Become a friend on MIASMA's FaceBook page. See CCS Events calendar for details.